ST-v-SW.Net :: To Russia With Love :: What Is Death Star? Re: What is Death Star? "I have no other choice than to call this hypothesis moronical." 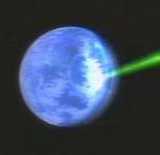 For those unfamiliar, the Superlaser Effect theory (aka "SF") is the only concept thus far which explains what is seen in the Star Wars canon regarding the Death Star superlaser and its destructive abilities. 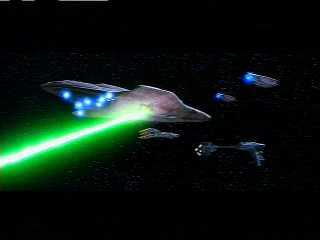 By analysis of the canon, the chain reaction technique of the superlaser was discovered. It answers the question of how a fusion-powered battlestation (as per the canon) can produce enough energy to destroy an entire planet with a 1e38J explosion, by pointing out and making use of the canonically-identified mass-energy conversion techniques. It answers the question of why rings and similar planar explosion phenomena appeared in every explosion involving or created by Death Stars by uniting the observations under the same umbrella. It explains why the Death Star was such an awe-inspiring weapon. In short, it is the theory of reason regarding the Death Star, in opposition to prior theories based on bad evidence, blind faith, and ignorance. One of the keystones to the Rabid Warsie position is their faith in Wong's belief that the Death Star could only have destroyed Alderaan via brute-force direct energy transfer (DET), in defiance of what is canonically observed. It comes as no suprise, then, that Stas would attack the Superlaser Effect chain reaction seen in the canon, just as Wong and Ossus have tried to do before him. He offers a list of several previously-seen counterarguments, all of which have been repeatedly shown to be flawed. (He even pulls a Wong Name Game, often calling the Superlaser Effect some silly name and hoping that will somehow defeat the concept.) However, as with the response to his canon page, I'll kindly answer them yet again. Q: Can I say that this quote from the ANH novel proves that DET had not occured in destruction of Alderaan, and the SF had taken place? It's worth noting, before we move to his objection, that Stas didn't bother with the "Luke didn't know how it worked, he was an idiot farmboy" objection so commonly attempted against the quote above. By not doing so, he has improved upon the standard Warsie line. As established in the novelization, everyone on Yavin was a-buzz with worried talk about the Death Star, and this buzz came while the schematics of it . . . the "most critical information" from the hours' worth of "diagrams, charts, statistics" . . . were being analyzed. A: No. Mass-energy conversion does not mean that the UCR occured on Alderaan. I wonder, why suddenly "mass-energy conversion" became "100% efficient matter-to-energy conversion when the superlaser strikes"? See? This whole claim is ONE BIG LEAP'N LOGIC! Speaking of which, where did he get this 100% efficient conversion from? Even in my original post which set forth the early version of the Superlaser Effect theory, I only used the 100% value as an example to show that, if it were 100% efficient, the Superlaser Effect would only need 1/5000th of Alderaan's mass to produce the 1e38J explosion. I did not say "lo, and behold, I have descended from on high to inform you that it was 100% efficient". But, hey, there's a language barrier, so maybe he missed the idea. Moreover, it's not "matter-energy" conversion, but "mass-energy". "Oh, gee, my nit's been picked now!" I guess he's never heard of E=mc², nor realized that the best source for mass is matter, nor noticed that Luke was talking about a planet (which, of course, is a big ball of solid, massive matter.) I can't excuse him by way of the language barrier on that one. What made you think that "mass-energy conversion" is the Superlaser Effect? Er, because the book said so, probably. Wrong. The quote reads: "Theoretically, no weapon could penetrate the exceptionally dense stone of the ancient temple, but Luke had seen the shattered remains of Alderaan and knew that for those in the incredible battle station the entire moon would present simply another abstract problem in mass-energy conversion" (italics mine). The context is weapons and destruction, not engineering and power generation. This would be like taking a battleship and saying "theoretically, no shell could penetrate the thick wall of the little bunker on the beach, but so-and-so had seen the shattered island of Alderaan, and knew that for those on the battleship, the entire beach would present simply another abstract problem in boiler technology." Anyone else reading that would say: "Boiler technology? What the hell?" But not Rabid Warsies. This, of course, is why people are still trying to make fusion reactors . . . because it's so terribly easy to turn swords into plowshares in nuclear physics. Really, though, the idea that the Empire has a chain reaction superweapon that blows up planets should've clued these people in. How do you contain a chain reaction that will quite happily blow a whole planet to smithereens? You're basically talking about trying to contain a mass-energy conversion effect that, as seen at Alderaan, will quite happily expand to encompass every bit of nearby material. Add to that the fact that to make this superweapon, they evidently had to build ridiculously huge starships with massive internal systems dedicated to the weapon. Assuming they could even control the reaction when it is in progress and/or make it controllably self-sustaining (two awfully huge assumptions), the smallest known example of the technology is still enormous, and requires similarly huge fusion reactors just to get it going. For our purposes, efficiency would be the amount of energy released in joules divided by the mass times lightspeed squared. In other words, the liberated energy versus good old E=mc². For example, let's say that the Superlaser Effect only required about 1/5000th (0.02%) of Alderaan's mass to produce 1e38J. That would be an efficiency of about 100%, equal to the efficiency of matter/antimatter reactions. In a common main sequence star like the sun, efficiency is actually around 0.8%.. Deuterium-deuterium and deuterium-tritium fusion reactions would fall within the same ballpark . . . a bit better, but not much. Getting a "mere" 1e38J out of that potential amount of energy would translate to an efficiency of 0.19%, or about four times less than fusion's efficiency. That would mean the Superlaser Effect is great for killing planets in a timely manner, but pretty sucky for sustained power generation. For comparison, half the mass of the planet would work out to 0.037% efficiency. One percent (1/100th) of the planet's mass would be 1.8% efficient. That last one, or any amount of one percent or less, works out to efficiency significantly greater than stellar fusion. But, of course, there's still that wee problem . . . fusion is comparatively easy to contain and employ. A sun is a big ball of fusion, like our own. Wong has repeatedly tried to play a shell game with the word sun by changing it to "star", and, when that fails, just lying outright and claiming that suns don't have to use fusion. Stas tries to pull the same thing. Even if we were to defenestrate logic in a similar manner, though, we're still stuck with a simple fact. The Death Star was powered by something which either (A) operates via fusion or (B) operates via some technology that produces a similar power output to fusion. Being generous, I grant 3e26W for the Death Star's power output . . . this is generous because that's roughly the output of a frickin' huge natural sun: ours. Thus, to charge up the superlaser for a 1e38J DET shot would require on the order of 8,200 years. the reference to "artificial sun" may not mean the Death Star's reactor, but the explosion of the Death Star. The explosion of the DS II was also compared to a star. I love this sort of claim more and more every time I hear it. "The liberated energy of a small artificial sun" is a description that is specific, direct, and to the point. "Like a fulminant supernova" is a floral comparison by use of simile. Somehow, though, we're supposed to assume that the former is as much as simile as the latter. Hell, it doesn't even make a good metaphor. This "objection" is a new one, though I can hardly think of a more minor objection. He's claiming that we don't know the energy content of the superlaser beam itself, prior to its contact with the mass of Alderaan. He does take it too far by asking if the Superlaser Effect mass-energy conversion required any energy at all . . . I'll be kind and forgive him this silliness, though, because to even suggest such a thing means he never saw the big huge glowing green superlaser beam. So, we have a lower limit of "more than zero" . . . I suppose one could calculate the lower limit more thoroughly by figuring out how much (green) candlepower the superlaser beam was throwing off to the side. More importantly, though, we have an upper limit. As the superlaser passes through the clouds, they are visibly undisturbed. If you've ever seen video clips of nuclear weapons detonations, then you've probably seen the way the clouds quite rapidly evaporate away from it as the ice crystals in those clouds are melted, and the droplets vaporized. crystals in clouds would be of similar proportions. Bulk liquid water, of course, would be harder to vaporize than the water in clouds, so 23.5 gigatons is a profound overestimation. On the other hand, if the superlaser beam bloomed significantly in transit (i.e. did not remain focused, and thus got much wider), the real value could actually reach the 23.5 gigaton range. That would be the actual energy content of the beam, insofar as heat and radiation and so on is concerned. 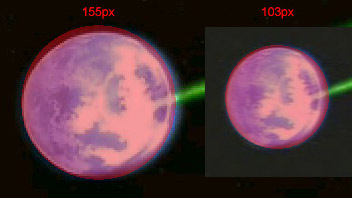 Of course, the actual effect of this beam was much more dramatic, once the mass of Alderaan came into play. if no or little energy is required for the process, then the Death Star is not limited in any way, and it could easily have blown up the gas giant Yavin. The reactants for a chain reaction are more likely to be found on gaseous Yavin than on a terrestial planet like Alderaan. As to whether they could've, remember that the Superlaser Effect did not start on the atmosphere of Alderaan, but on the surface . . . hence the undisturbed clouds. It does not follow from this, though, that the superlaser would've zipped right through Yavin unimpeded, because the Death Star waited to fire until they had a nice, clear shot. We're told in the ANH novelization (chapter 11) that the gas giant had a "comparatively small core of frozen liquids". The fact that the Death Star waited to fire implies that the "boiled rolling gases" above these liquids might've adversely affected, or altogether prevented, the superlaser beam's passage. 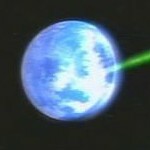 Stas quotes Sansweet regarding this very thing: The Death Star's superlaser is very powerful, but it's not all powerful. Relatively speaking, a terrestrial world of rock and metal like Alderaan is easier to blow up than an immense gas giant like Yavin, from Sansweet on SWOS. Now, it is possible that they could've blown up the small core of frozen liquids, if the beam could've cut through to the core. It might even have produced a similar 1e38J explosion against that core, if "comparatively small" meant "Earth-sized". But, as even the Warsies have pointed out to Stas, a 1e38J hit against a gas giant would hardly have the same explosive effect . . . any expansion of the remains of the huge gasball would be much slower. 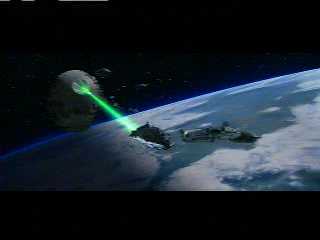 In the canon, the Death Star is orbiting the thing to get into firing position against the moon on the far side. They may or may not be able to blow up Yavin (for whatever good it would do against the distant Rebel base) and wait for the superlaser to recharge, or they could just orbit the planet. Seems to me it was a better idea to save the shot. but in fact a delay and a bright glow is observed, which can only be explained by a shield. Note how the "bright glow" happens to follow the line of the clouds, just as we would expect from the diffraction of the helluva-bright light (brighter, even, than the refraction of sunlight) one would get from the start of a planet's explosion. For some reason, we're supposed to believe that this planetary shield, while keeping itself quite invisible, manages to re-radiate the energy of the superlaser beam in keeping with the local weather patterns. The hell? What we actually do see is the superlaser impact against the surface of the world, with the blinding flash radiating outward, diffracted by the air and clouds. And, as you can see, the clouds are not instantly burned off by the superlaser's passage through the clouds. This sort of thing is proof of how easy it is to be a Rabid Warsie. Just ignore your own canon, steal the shielding techniques of someone else's canon, pretend to see those shields when they obviously aren't there, and voila! Magic invisible Star Trek-ish planetary shields resisting the Death Star by radiating the energy along the local weather patterns! Why, it's so simple, it just has to be right! But, of course, Stas doesn't stop there. 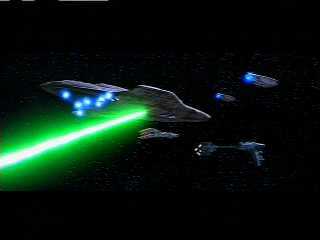 After the superlaser strike, a shield glow appears. It is not a part of the planet's sphere. Wrong. By drawing near-circular ovals, Stas has attempted to pass off a very poor argument by the use of visual aids. As you can see, his red oval and my red circle are together most of the time, except on the northern pole, and on the right. His yellow oval is just all over the place. Stas has stated that he downloaded the version of ANH he has. Was it just a bad vidcap, or a deception attempt? Either way, his version is wrong. 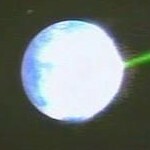 Unless Alderaan spins like a top gone mad, it should have an equatorial bulge on par with Earth's . . . about 43 kilometers of extra diameter at the equator, compared to the poles. For an object with an average diameter of over 12,000 kilometers, such a bulge could hardly be noticeable from a distance. It would be less than one-half of one percent . . . the planet would look like a circle. Stas's Alderaan is not a circle. It's not even close. So, not only did he not even try to draw circles correctly, but his source material was (intentionally?) flawed. And should I even mention the fact that you can see atmosphere on the left of the planet, as well? (Sigh) . . . c'est la vie. You see, the color of the superlaser has changed as it passes the border of blue light. It is not lit up by atmosphere or any part of planet, it changed color not only over white regions, but also over the unaffected blue regions. This change of color can only be attributed to the light of the shield. This is absurd. Somehow, he thinks that a translucent beam of light can't possibly look different due to light from the planet which is appearing behind it . . . therefore, somehow, the shield must've actually changed the color of the superlaser beam elements which had not yet hit his fanciful shield. Go back up a bit and look at how I overlaid red on top of the planet. See how the planet is still visible through the red? This is the reason I did it that way . . . the red itself has not changed color where you can see the planet (I sure as hell wasn't about to redraw the planet on top of the red). It's just got planet showing through it, affecting the final color you see. This is called blending. Stas does not understand blending. Q: But the shield was not mentioned in the novellization! A: Oh really? 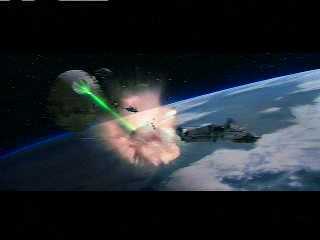 In the ANH novel, Vader spoke of Alderaan's defences, which were seen during the superlaser strike. He spoke of the shield. and fight them with your own fighters and starships? castle defenses by attacking in a totally new way.
. . . i.e. from the air. A more sci-fi analogy would be to refer to planetary bombardment versus invasion with troops and tanks. Or, hell, you could mention the Battle of Britain or V-2 rockets, which showed air power nullifying Britain's defensive advantages of a powerful navy and separation by water by utterly bypassing them. Similarly, the ion cannons, orbital platforms, fighters, starships, and so on that would logically comprise the majority of a major world's defenses in Star Wars are rendered useless by the long-range, one-shot-one-kill superlaser. It lacks the finesse of a well-coordinated fleet assault on an enemy world, but makes up for it by sheer utility. Q: Why, he could have meant something else! A: What else could have affected the superlaser? Ion cannons, defence ships? [...] Vader would not talk about the defences referring to the superlaser demonstration, since any other defence that shield could not have affected the superlaser. Neither ion cannons nor defence space ships were seen. (Raises hand) . . . why in the world are we to assume that Vader could only have been talking about defenses against the superlaser? If I blew the hell out of a castle with bombs from an F-15, could I not explain that, despite the Princess's protestations to the contrary, Castle Whatever's defenses were as strong as any in the kingdom? I'd certainly conclude that my demonstration was as impressive as it was thorough, especially to those residing in other castles. The Death Star was a weapon of sheer terror . . . there was no defense against it, and that was the point. In short, Stas argues that there was no defense because his hypothesized possible defenses were overpowered, and that this somehow proves that his fancied possible defenses existed. I argue that there was no defense because there was no defense . . . nothing like the Death Star had ever been seen before, as is stated or suggested frequently in the canon. Stas's reasoning is circular. His circles aren't. Go figure. 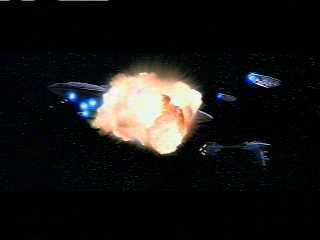 The Death Star is shown to be able to destroy not only planets, but also spaceships, which are instantly vapourized. Vaporized? Perhaps, but not right off . . . the ship's hull lines were clearly visible at the start of the explosion. In any event, the second Death Star was capable of off-axis firing of its beams, allowing it to blow Rebel vessels straight to hell with some very interesting planar explosions. while SF can even deny the very need of energy released. Presumably, the language barrier has produced a horrendously erroneous conclusion in my new friend's mind. That's the only way I can imagine he might've concluded that ships getting blown up could somehow involve zero energy release according to SF. Given the huge explosions, and their planar aspect common to all Superlaser Effect episodes, it's no leap to conclude that the DS2 ship-killer superlaser shots included some SF component. Whether the beam had enough inherent firepower to overcome the shields, as opposed to there being no shields protecting those ships, is open for debate. However, given (1) the hull strength of ISD bridge towers and Trade Federation ships versus collisions with asteroids and fighters, and (2) the fact that puny, sub-kiloton Naboo fighter torpedoes were capable of causing extensive external hull damage to even a shielded Trade Federation battleship (as seen by the destruction of one of the ship's dishes), then it's rather likely that even the gigaton-level superlaser beam firepower demonstrated against Alderaan's atmosphere would've been more than sufficient, even scaled down for the smaller DS2 shipkiller beams, to penetrate the Rebel shields. the ANH opening crawl states the Death Star has enough power to destroy a whole planet. [...] Note that the word "power" in this sentence does not mean the mere ability to destroy the planet, since the word "enough" was applied to it. You can't have enough ability. Picard: "Guinan, it is very important that you tell me everything that you know. We think that Soran has developed a weapon . . . a terrible weapon. One that might even give him enough power to destroy an entire . . .
Guinan: "Soran doesn't care about weapons or power. He just cares about getting back to the Nexus." Funny . . . Soran's trilithium weapon that had enough power to destroy an entire solar system did not, itself, have the firepower to do so. It caused a freakish reaction that halted nuclear fusion in the sun of the system, producing a profound spherical shockwave that, in the case of the Veridian system, was capable of utterly blowing apart the third planet. And yet we're supposed to assume, based on the good word of our new Russian grammarian friend, that the Death Star had enough power in a totally different way, despite the canon demonstrations of the Superlaser Effect. Well, gee, I'm convinced. And I agree. Duh. Now, if they'd said that the prime weapon fired unthinkable levels of raw energy, he might've had something . . . but even then, that would only be something if StarWars.com could override the canon film and novelization, which it can't. Probably so. In some of the EU, ships are powered by hypermatter, which is re-defined from the present-day term relating to hyperon particles into some sort of uberdense magical helluva-powerful material, instead of the fusion or fusion-power-level system canonically described (and present in the rest of the EU). The superlaser itself is defined in one work of the EU as some sort of compound turbolaser. Of course, this is the same EU that can't decide whether starship weapons are 200 gigatons or sub-megaton weapons barely capable of vaporizing ponds and starting forest fires, isn't sure if fighters have kilojoule or kiloton weapons, and so on and so forth. Gee, I'm convinced. The rings are some kind of phenomena which follows large blasts. Oh, well, that explains everything. The fact that all three of those blasts were Death Star-related seems to have been lost on him. Similarly, he ignores the planar explosion effects of the Rebel ships like the Liberty, instead saying that because they didn't have well-formed rings, they somehow refute the concept that planar explosions and the Death Star have anything to do with each other. There is no theory which explains the nature of the rings. They can only prove that something else is going on besides DET. The rings are an unknown side-effect. If we assume that the planet's explosion is caused by the SF, the rings are still caused by an unknown mechanism other that matter-energy conversion. So the rings and the SF are separate and different effects. Did you follow that? What he said, translated, is this: "If we assume that the Superlaser Effect only caused the planet's explosion, then the rings must've been caused by something else. So the rings were not caused by the Superlaser Effect, and must've been caused by something else." Well, duh. By making the assumption he made, that was the only logical result possible. The problem, of course, is with the assumption he made. That assumption explicitly denies the correlation always seen in the canon. In other words, if you always see A + B and know that these are caused by X, then by choosing to assume that A and only A is caused by X, you must undoubtedly start seeking some other cause for B. Clever. Stupid and deceptive, but clever. Matter-energy conversion is defined to be the Superlaser Effect. The ring can only be attrbuted to the superlaser, but not explained through SF, same as in case of DET. The rings stand diametrically opposed to the DET theory, which must then craft ad-hoc theories about their origins. A prime example of this is Stas's assertion that EU hypermatter reactors explain the Death Star I rings. Well, what about Alderaan? Had they stuck a hypermatter reactor in its core? And why was the second Death Star's ring centered on DS2's center of mass? That hardly makes much sense, since the reactor was in the center of the station, far from the center of the station's incomplete bulk. Meanwhile, the rings are an acknowledged part of the Superlaser Effect, fitting beautifully within it. Somehow, this equals out to Stas. Go figure. Stas then begins his comments on the band. To his credit, he improves upon Ossus and Wong, who invariably insist that there is more than one band (while simultaneously denying the existence of even the first one, and yet being able to measure its speed). Once again, we see Stas drawing round things on otherwise-pretty pictures. Below, we see a dark line representing where my new friend believes the band should be. I find his assertion peculiar, especially given that he includes the superlaser in the image . . . as you can quite easily see, it cannot possibly strike in the center of his dark semi-circle, whether you're looking at the planet as a circle or as a sphere. Now look at where the superlaser actually hit . . . basically just to the right of planet center, from our perspective. Stas has the beam hitting somewhere on the upper right edge, judging by his dark semi-circle. I really have no idea how he came to conclude that his dark line showed where the band should be . . . I mean, there's no such thing as a visual language barrier, is there? Well, I suppose there would be if he were blind, but still. In the above, we see an enhanced view of the Alderaan destruction. Everything above a certain brightness level is white, and everything below it is black. Frames 2 and 3 show you the Alderaan cloud patterns as mentioned before. The band is readily visible in frames 6-24.
the "band" is not even near to a round curve - an angle is clearly seen [...] I think that would be enough to show that no band exists, and bright places are random on the surface. As noted several times previously, the band is not a mathematically-perfect circle, nor can I think of any reason for us to assume it would have to be. It's somewhat amusing, then, that Stas (of all people) considers the fact that a perfect circle is not seen as sufficient cause to dispute the existence of a band, and claim that the whole thing is just a big random happenstance. I guess he's never seen a "band of thunderstorms" on a radar. 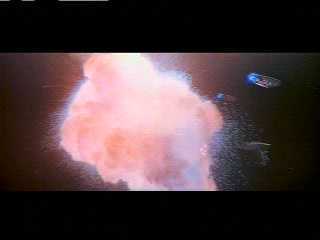 Q: Can I say that the secondary explosion in Alderaan's destruction proves that SF is the right theory, and DET is false? A: No. The secondary explosion can be well explained by DET. That's it. That's all he says. Wong had to invoke an invisible continuation of the superlaser, or multiple invisible superlaser beams converging from all sides (magically from one beam), in order to desperately try (and fail) to explain the secondary blast. And yet, here, we are assured that there's really nothing to see here, and to go on about our business. In reality, DET theorists have jack to say about the second, much larger blast which occurs after the termination of the superlaser beam, much as we saw with the Liberty's sudden eruption. They just ignore it, as usual . . . just like everything else that shows how bogus their wankfest theory is. For the most part, Rabid Warsies have been getting even more extreme with each passing year. I really have to give Stas credit for accepting at least a few obvious bits of information here and there, even if he still refuses to acknowledge the big stuff. There may yet be hope for them, after all.